Home Resource What is Python used for? Python is a scripting language used for the development of large scale web apps because of the features provided by it and not by other languages like .NET, PHP, etc. Also python provides several frameworks like Django and Pyramid and micro-frameworks like Flask and Bottle for easing the process of web development. Apart from these, python also come equipped with advanced content management systems such as Plone and Django CMS. Apart from these, python comes with a bunch of other libraries that facilitate its users to perform cool works. We will talk about these other libraries later in this post when required. Python offers a bunch of alternatives for the development of GUI such as PyQt, Tkinter, Kivy, etc. But among these Tkinter is the mostly adopted option by the developers for the development of GUIs. Also, it is seen that python hasn’t gained that much of popularity in the field of GUI development professionally (although it was proven best in a survey done in 2014). It is proven that there are better alternatives than Tkinter and PyQt or we can say python. Let us see what professionals has to offer when it comes to GUI development. It is advised to use .NET and C# while developing GUI for windows, Swift/Objective-C and Cocoa while on Mac and C++/Qt or Java/JavaFX while designing GUI for Linux platform. 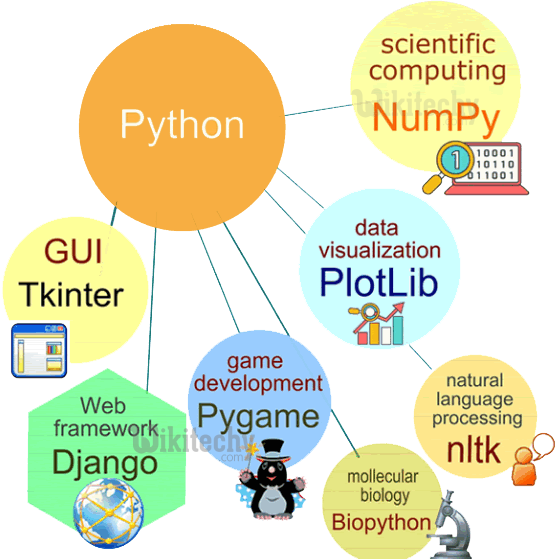 While using python for the same, the Tkinter library is the most commonly used one for accomplishing the purpose as it is proven as the fastest and easier way to go with the development of the GUI. GUI creation with the help of Tkinter is much easier. Kivy, which is the most recent among the modules is used for the purpose of writing multi-touch applications. In recent years python has marked remarkable growth in the business, e-commerce, and trading sectors. It is also quite feasible to make ERPs with the help of modules provided by python. We can see nowadays python is primarily being used for the qualitative and quantitative analysis of stocks, cryptocurrencies etc. One of the prime application of python by the use of its modules like Numpy, Pandas, scipy, etc is prediction of stock prices and cryptos in business world. Being easier to maintain and comparatively lesser code density and its ability to be easily integrated with other languages and platforms, python is being one of the firsts choices. The trading sector is the field which requires a lot of analysis which could be deployed easily using python. The trading experts make winning strategies and forecast the market trend using python and to your knowledge this application is accomplished by using Django framework using python. Payment gateways can also be deployed via python using Django framework. Pandas: Used for analysing the dataset (bunch of data). SciPy: Used for science, engineering and math works. IPython: Used for easy editing and recording of work sessions. Python has remarkable work in field of automation, AI and machine learning. These days if we talk about machine learning models or about automating a vehicle or a spaceship, from Tesla to NASA, python is everywhere. We have tried to cover the most prominent uses of this scripting languages and haven’t included the most obvious python applications as they are well-known. If there is any suggestion or query, please let us know in the comments below, we will be happy to help. Next article10 best Halloween apps for Android!